Learn detailed information about our unique event spaces before selecting your preferred level of service: Self-Service, Select Service, or our premium Concierge Service. 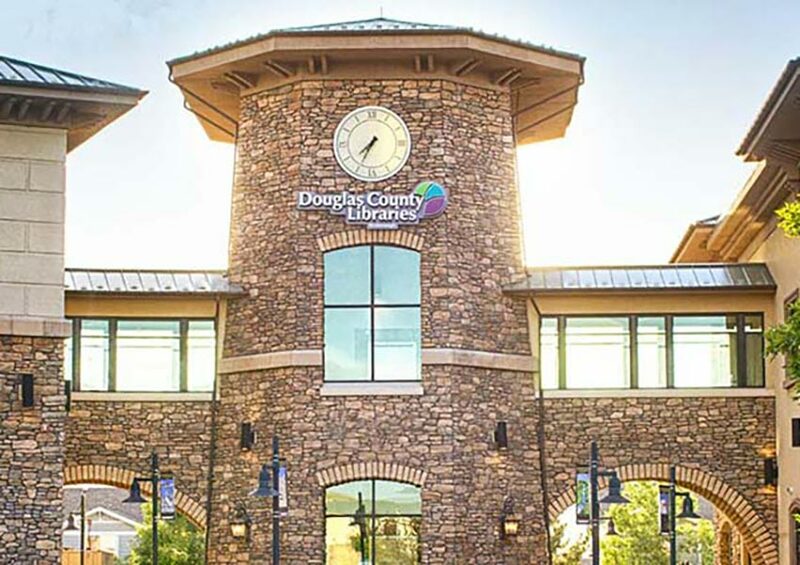 With questions or to discuss the details of your event, call Event + Hospitality Services at (303) 688-7605. Only available through Concierge Service. Call for details. 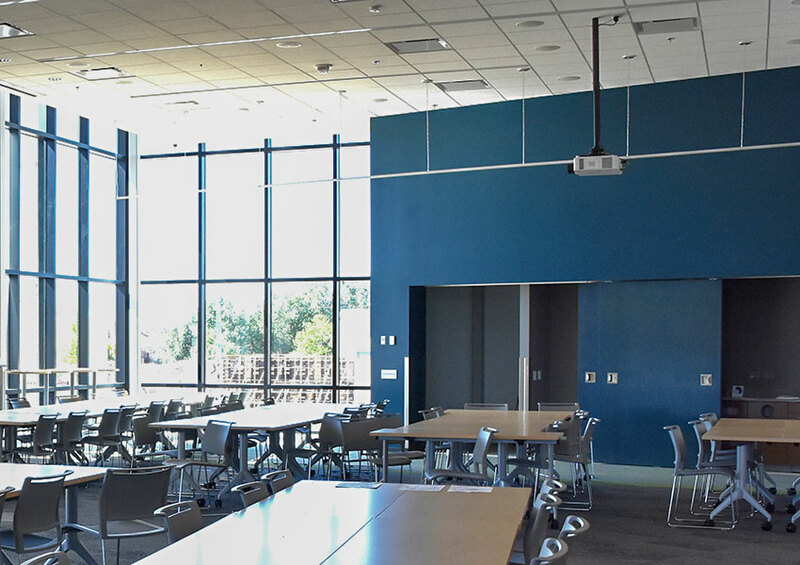 A sliding air wall can be opened to extend the classic Event Hall on the lower level into the library's open book space for greater capacity. The Event Hall features a wet bar, Wi-Fi, audiovisual amenities, a separate entrance/exit, and access to the outdoor patio. 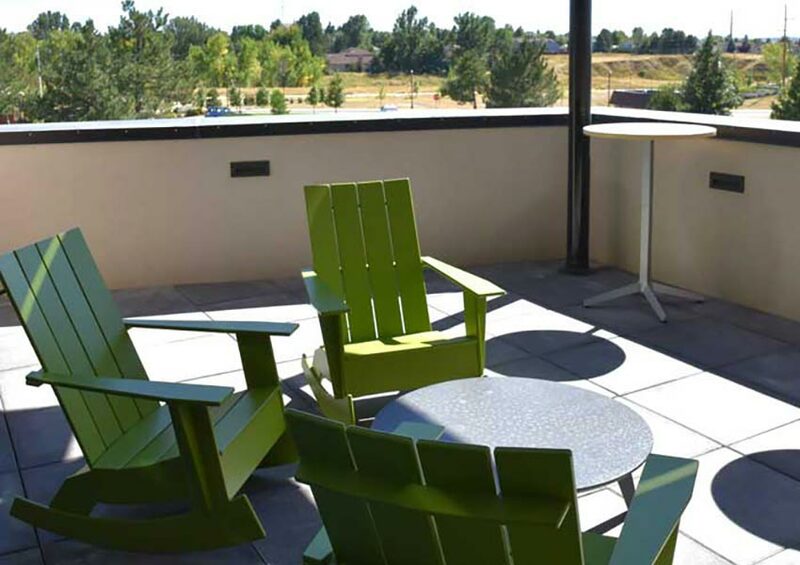 The covered second-floor terrace is adjacent to the green roof and features Wi-Fi internet access, a fireplace, and stunning Front Range vistas. 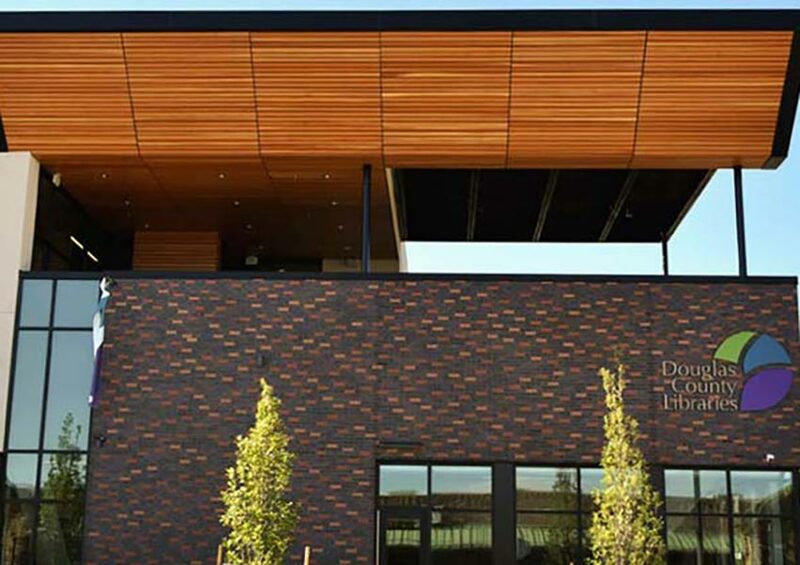 Located on the lower level, this classic event space features a wet bar, Wi-Fi internet access, built-in audiovisual equipment and projection screen, hearing loop for use with hearing-impaired guests, separate entrance/exit, access to the outdoor patio, and an abundance of natural light. 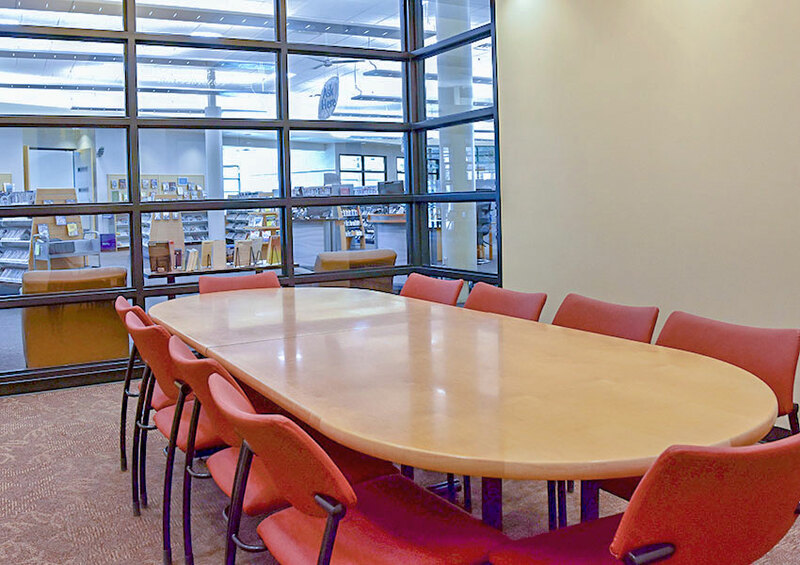 Located on the lower level of the library, this private room features Wi-Fi internet access, a 65-inch LED television, Blu-ray player, and table-mounted HDMI connectivity. 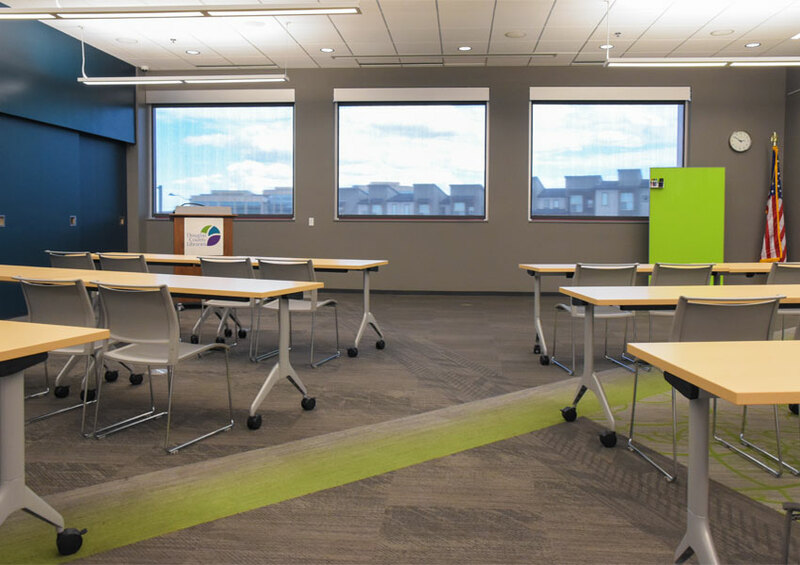 This combined event space provides all the features of both rooms—ceiling-mounted projector, projection screen, sound system, and Wi-Fi internet access—for additional capacity. 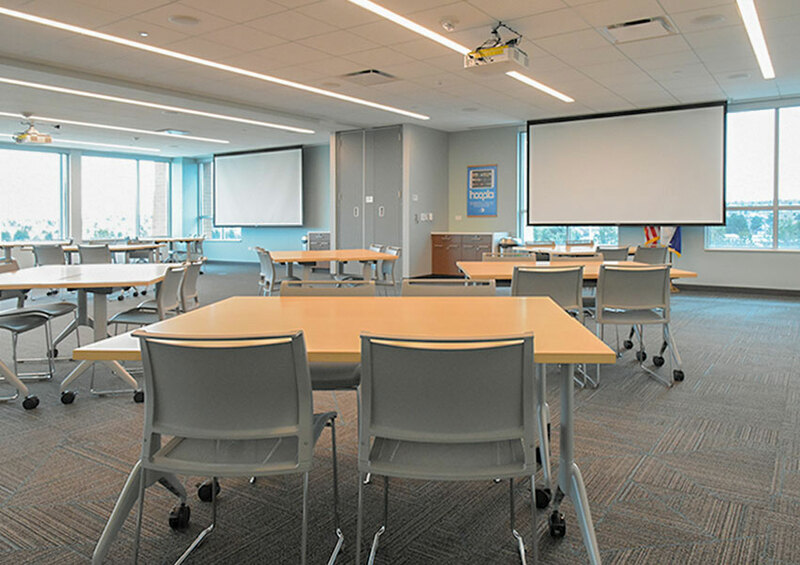 This classic meeting space features a ceiling-mounted projector, projection screen, sound system, and Wi-Fi internet access. 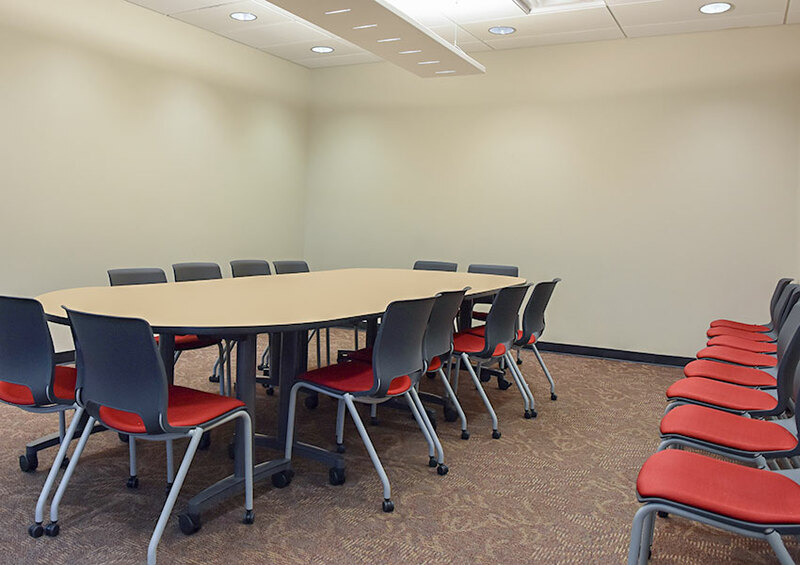 The meeting space features a ceiling-mounted projector, projection screen, sound system, and Wi-Fi internet access. This conference room includes Wi-Fi internet access. 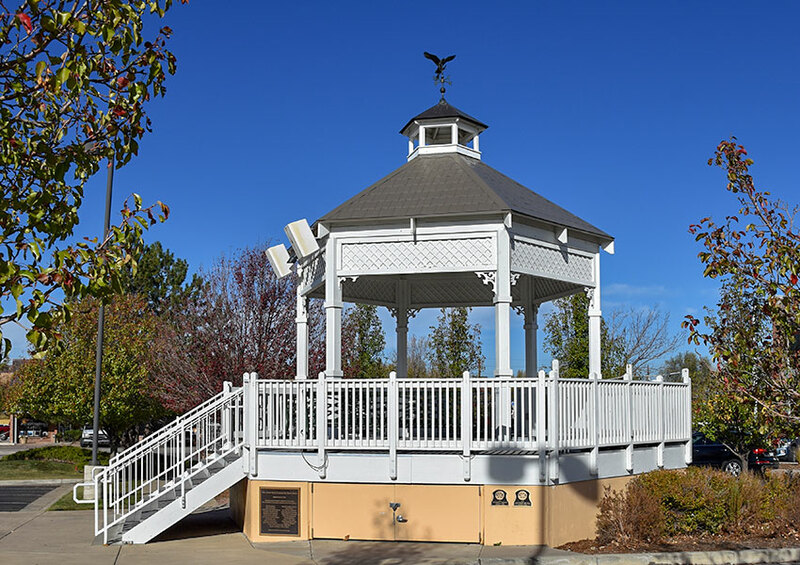 The covered, open-sided bandstand is located in the west parking lot of the Castle Rock – Philip S. Miller branch. 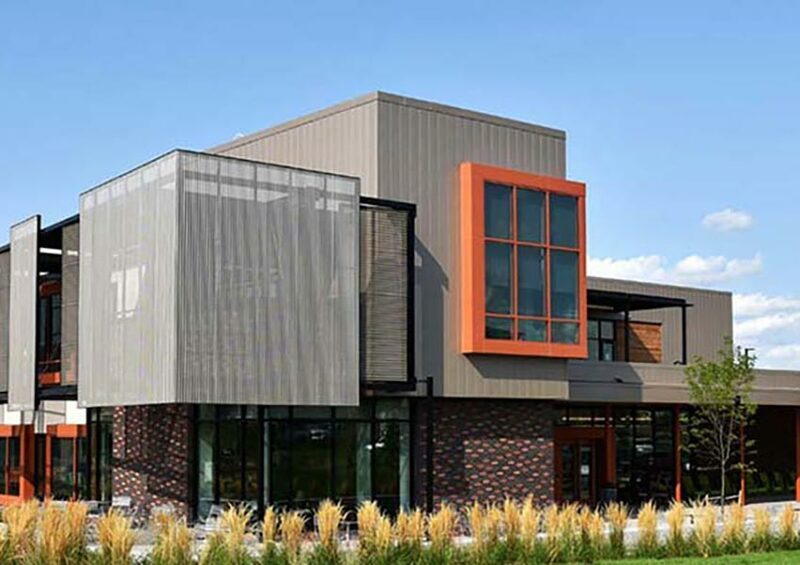 It is an ideal performance venue equipped with electrical outlets. It also accommodates a sound system and folding chairs. 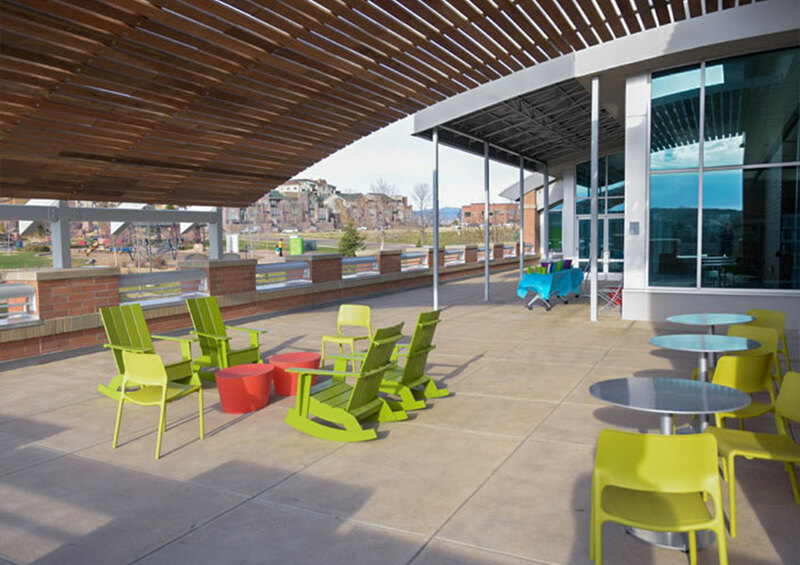 The large, open-air terrace overlooks Civic Green Park and features Wi-Fi internet access, two separate entrances/exits from the main library space, and limited outdoor furnishings. 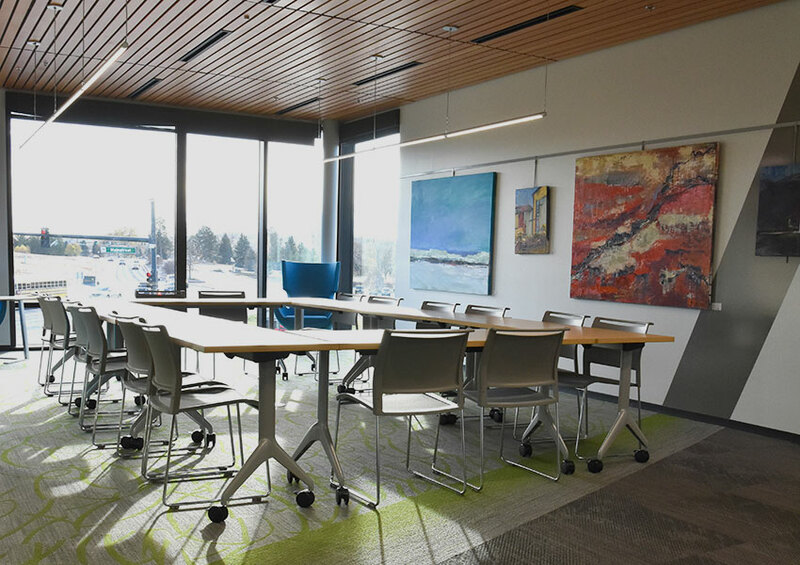 This combined event space features Wi-Fi internet access, built-in audiovisual equipment and screens, a Blu-ray player, a hearing loop for use with hearing-impaired guests, and Front Range views from the north windows. 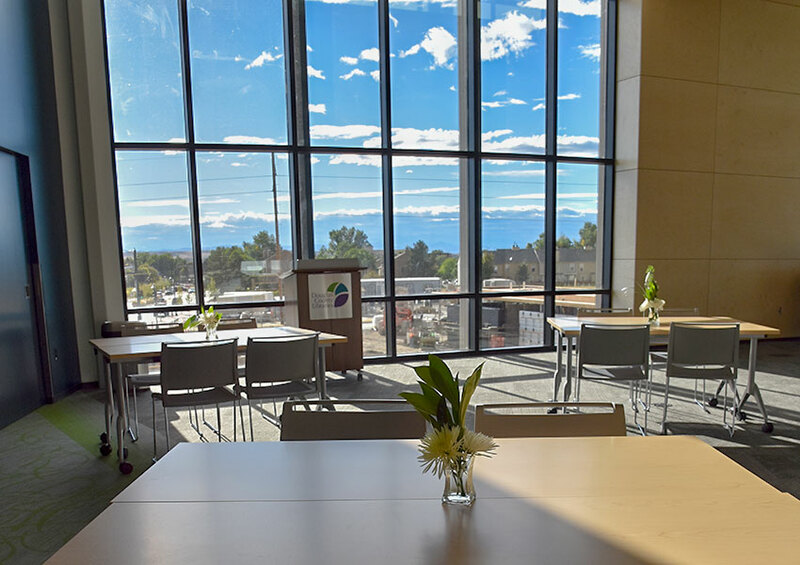 This private event space on the second floor features Wi-Fi internet access, built-in audiovisual equipment and screen for presentations, a Blu-ray player, a hearing loop for use with hearing-impaired guests, views of the Front Range, and an abundance of natural light. 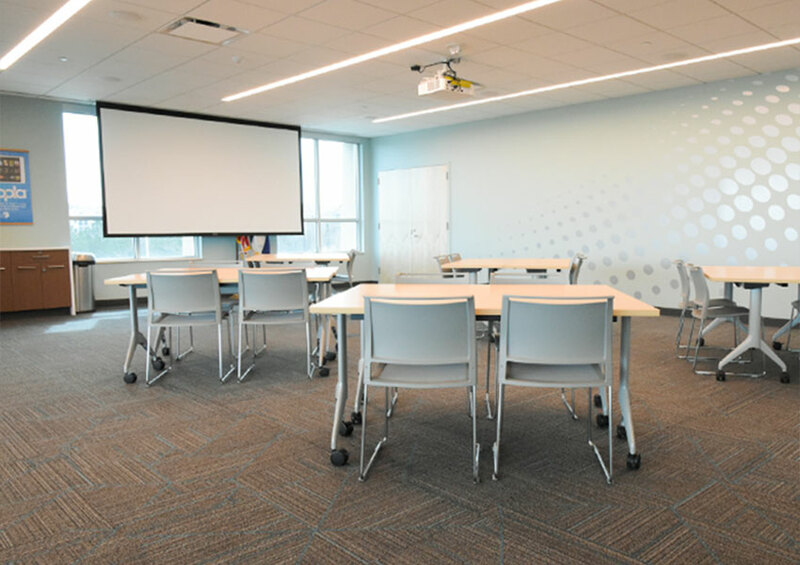 Located adjacent to Event Hall A, this private space features Wi-Fi internet access, built-in audiovisual equipment and screen for presentations, a Blu-ray player, and a hearing loop for use with hearing-impaired guests. 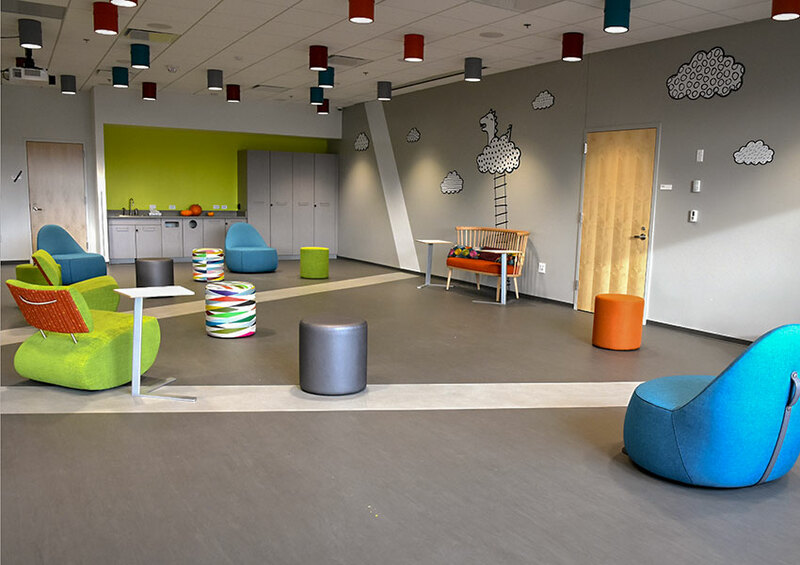 Located on the first floor, the dedicated Kids Corner features a sink/light wet bar and a high-tech, ceiling-mounted projector and screen to aid in detailed presentations. 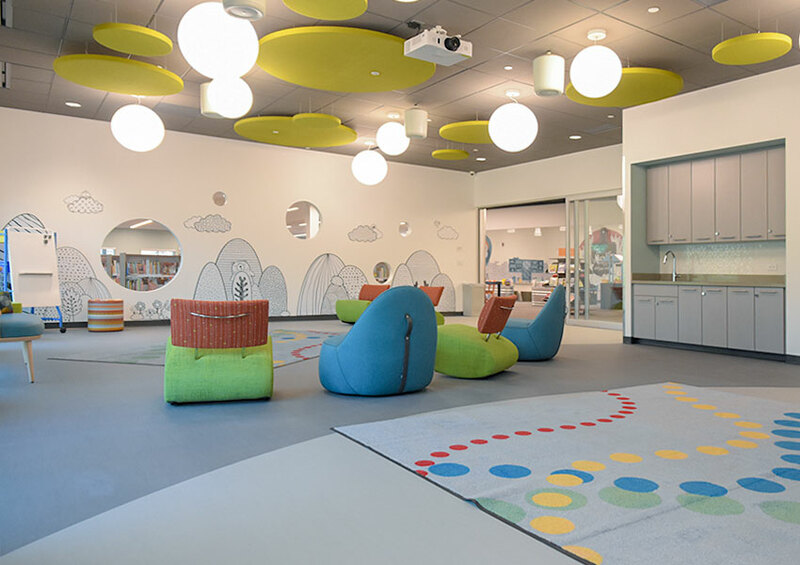 A sliding glass wall makes it easy to open the space to the children’s area—or close it off for privacy. 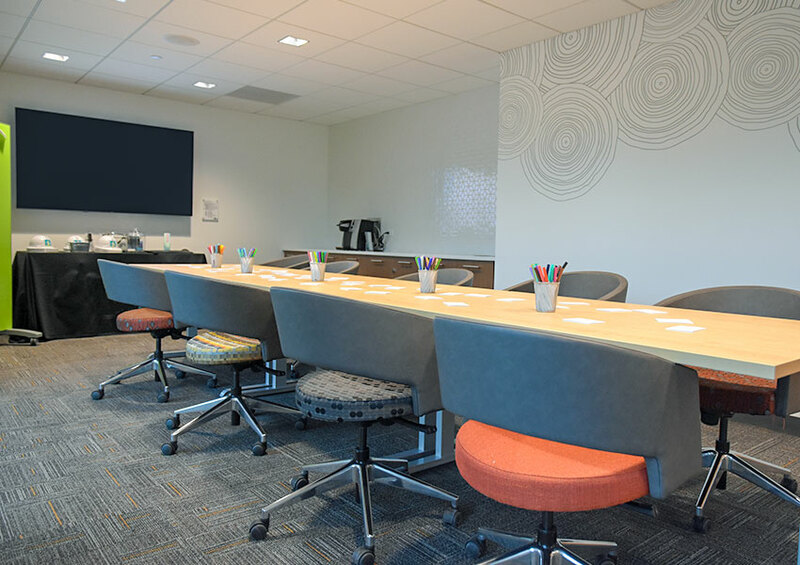 Located on the first floor, this conference room features Wi-Fi internet access, built-in audiovisual equipment that includes a wall-mounted 65-inch LED television and Blu-ray player, and HDMI connectivity. 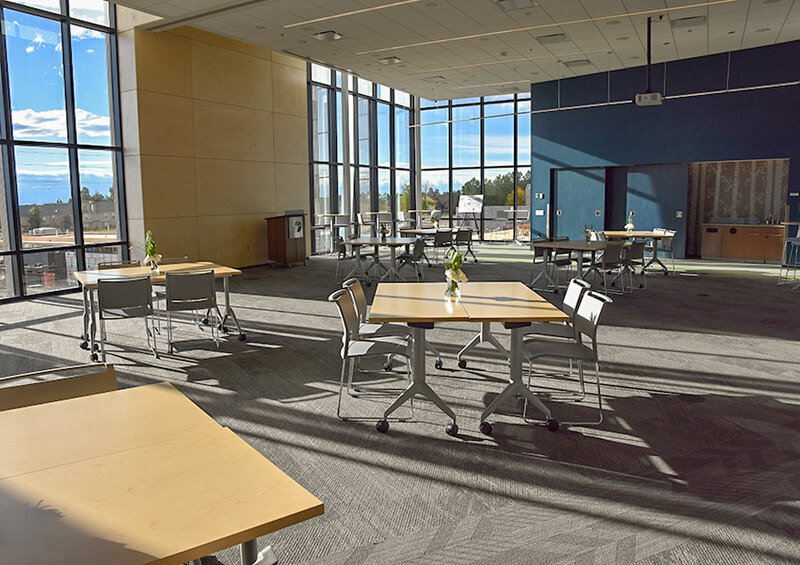 The AV, Wi-Fi and wet-bar features of the second floor Event Hall are available for a larger group when the flexible room is opened into the library's book space. 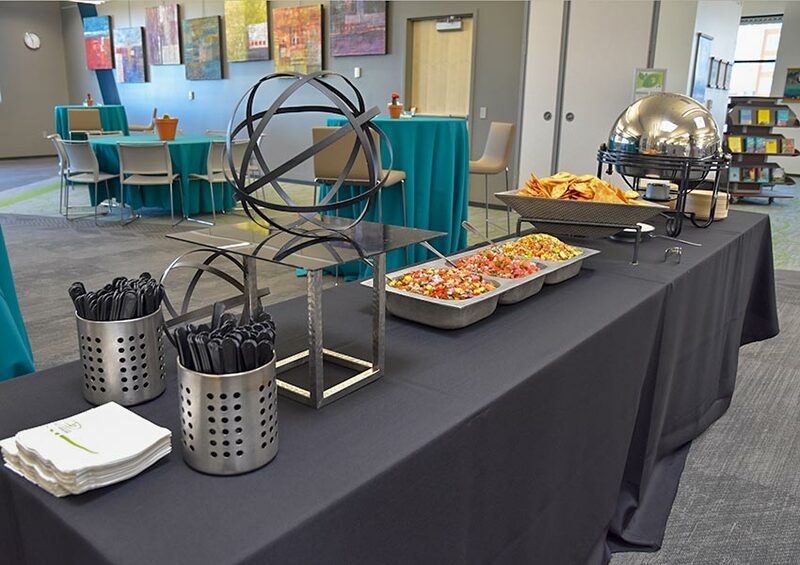 Located on the second floor, this classic event space features a wet bar, built-in audiovisual equipment and screen for presentations, a hearing loop for use with hearing-impaired guests, and Wi-Fi internet access. 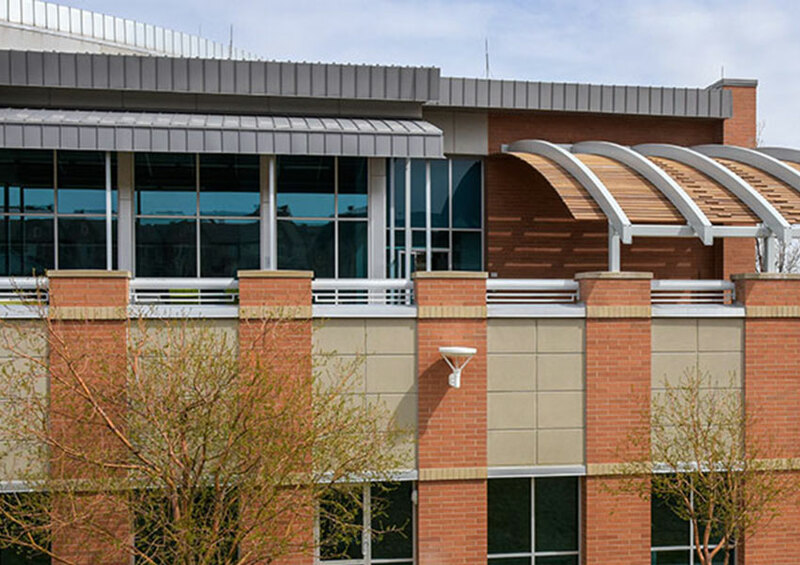 The open-air terrace on the second floor is adjacent to the green roof. 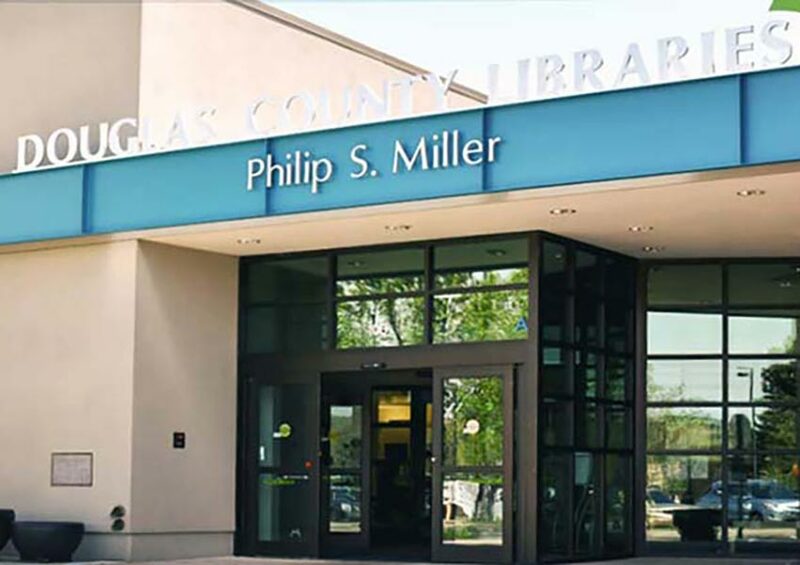 It offers Wi-Fi internet access and two separate entrances/exits from the main library space. 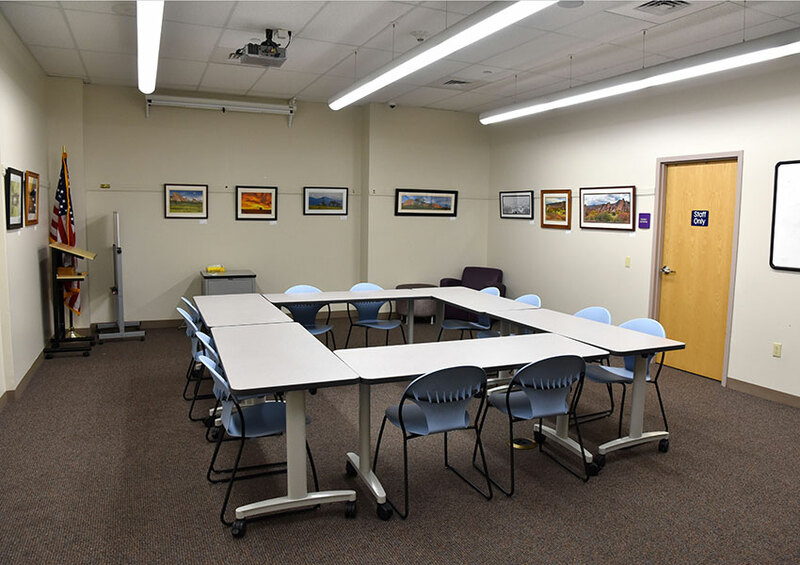 Located on the first floor, the spacious Kids Corner features a sink/light wet bar, Wi-Fi internet access, and a high-tech, ceiling-mounted projector and screen to aid in the most detailed presentations. The room also offers a separate entrance/exit, and a barn-style sliding door for privacy. 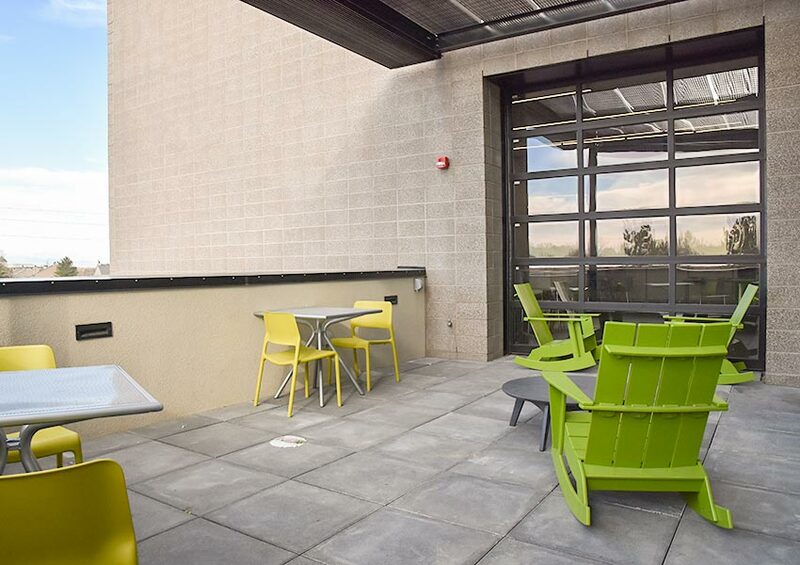 Located on the first floor, The Studio features floor-to-ceiling windows and an abundance of natural light. 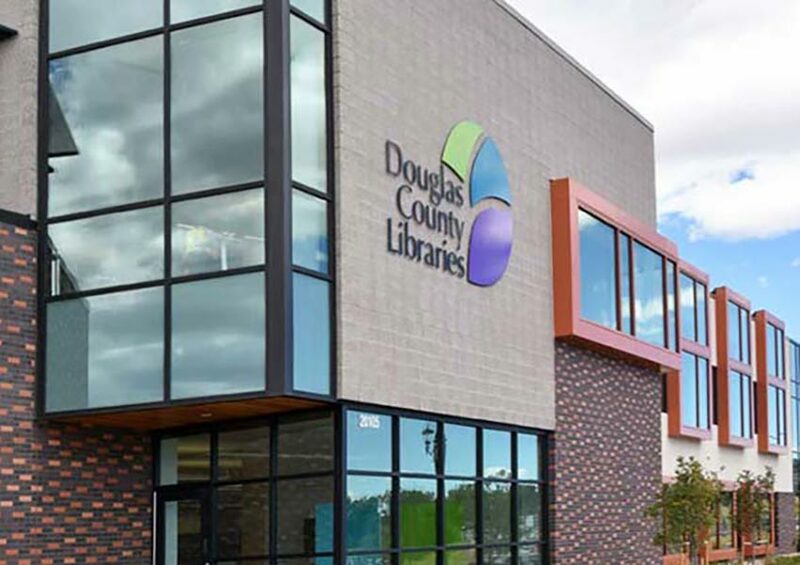 It offers a separate entrance/exit from the building, and additional privacy with sliding glass doors separating the space from the main library. Wi-Fi internet access and mobile audiovisual equipment, including a 65-inch LED television and Blu-ray player, are available. Dimensions: 33'9" x 45'6" + 14"3" x 18'10"
This combined event space on the second floor features Wi-Fi internet access, a wet bar, built-in audiovisual equipment and screen for presentations, a hearing loop for use with hearing-impaired guests, an abundance of natural light through floor-to-ceiling windows, and west-facing views from the small terrace. 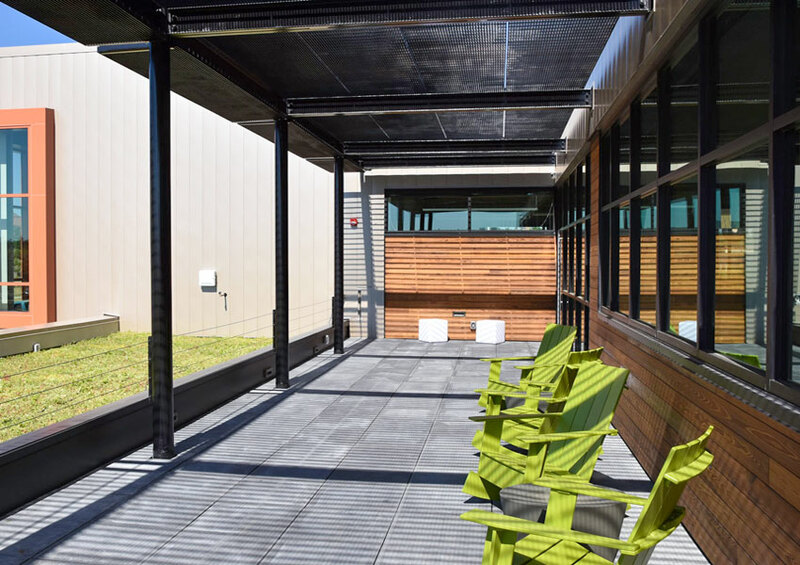 This combined event space features Wi-Fi internet access, a wet bar, built-in audiovisual equipment and screens, and terrace access. 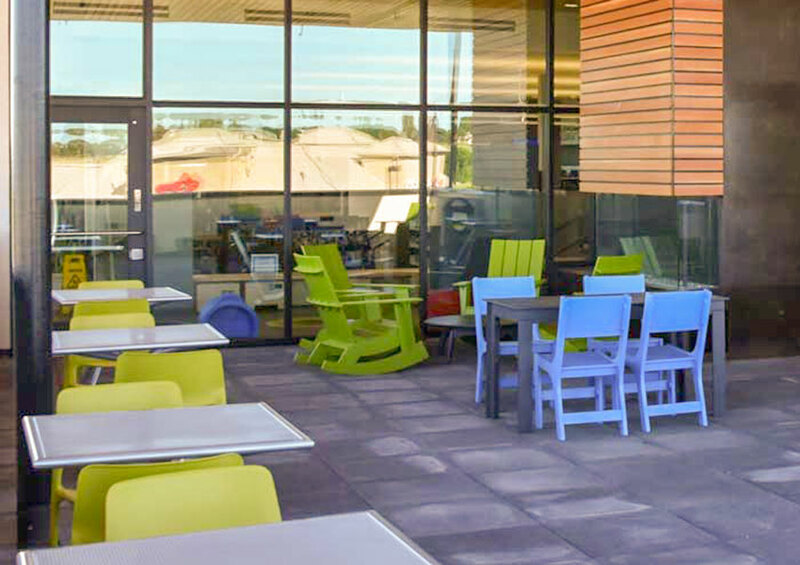 The private event space on the second floor features Wi-Fi internet access, a wet bar, built-in audiovisual equipment and screen for presentations, a hearing loop for use with hearing-impaired guests, access to a small terrace with west-facing views, and an abundance of natural light. 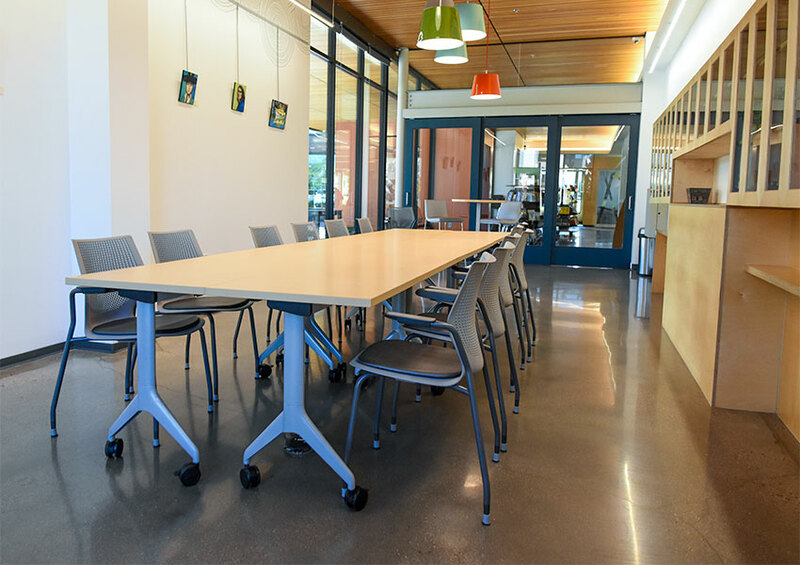 Located adjacent to Event Hall A, this space features Wi-Fi internet access, a wet bar, built-in audiovisual equipment and screen for presentations, a hearing loop for use with hearing-impaired guests, and an abundance of natural light. Dimensions: 33'9" x 22'6" + 14'3" x 18'10"
Event Hall A combined with the terrace features Wi-Fi internet access, a wet bar, built-in audiovisual equipment and screen for presentations, a hearing loop for use with hearing-impaired guests, plenty of natural light in the room, and west-facing views from the small terrace. 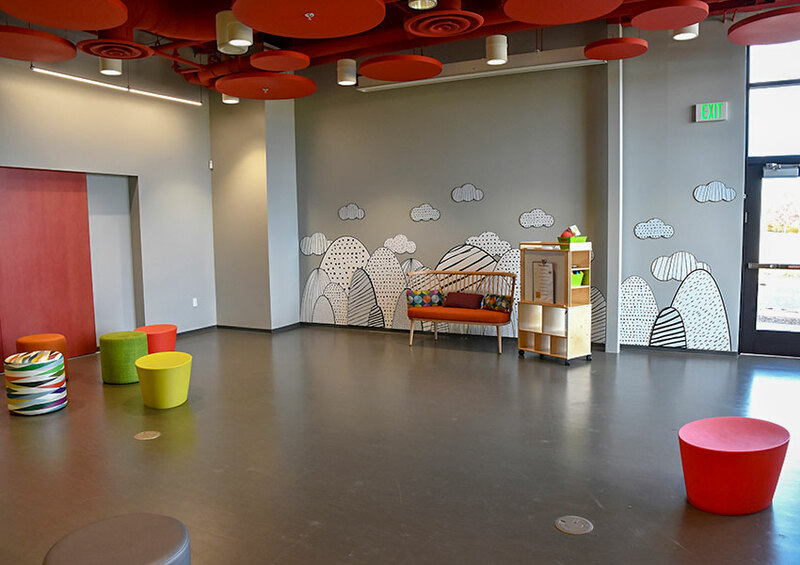 Located on the first floor, the spacious Kids Corner features a sink/light wet bar and a high-tech, ceiling-mounted projector and screen to aid in the most detailed presentations. 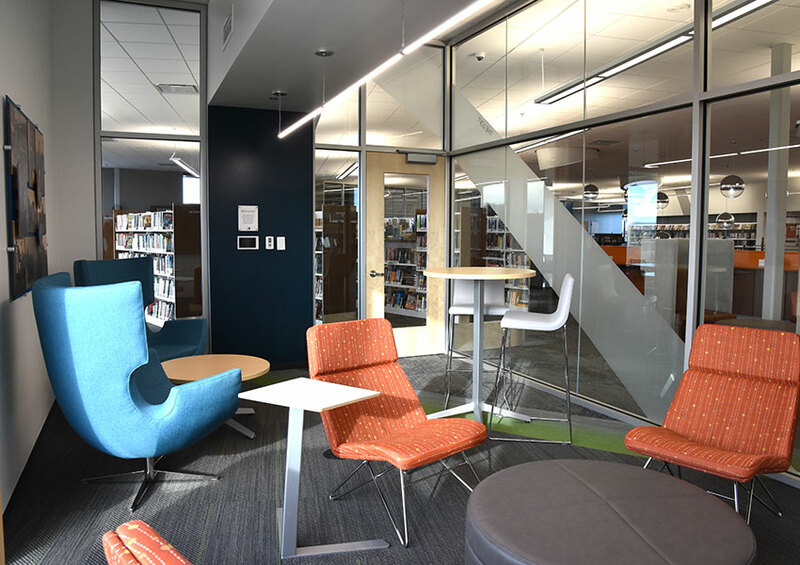 A sliding glass wall makes it easy to open the space to the main library area—or close it off for complete privacy. 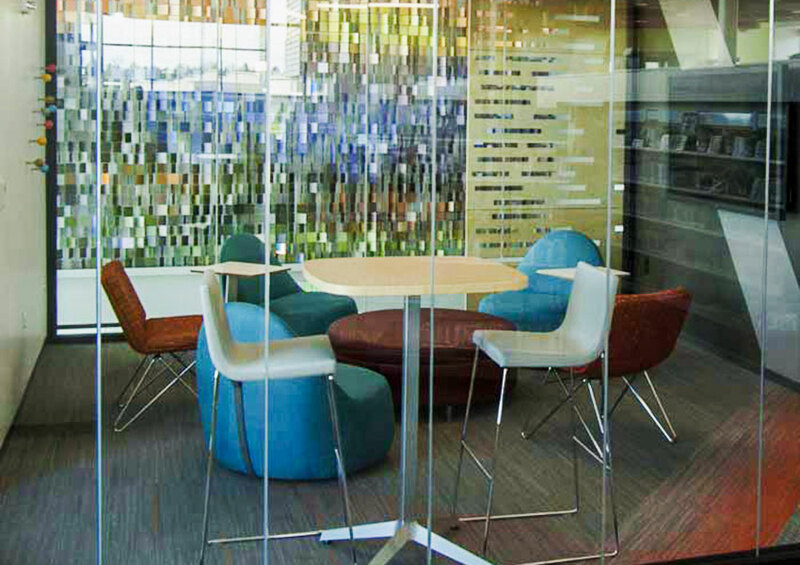 Located on the second floor, this light-filled room features Wi-Fi internet access and mobile audiovisual equipment that includes a 65-inch LED television and Blu-ray player. 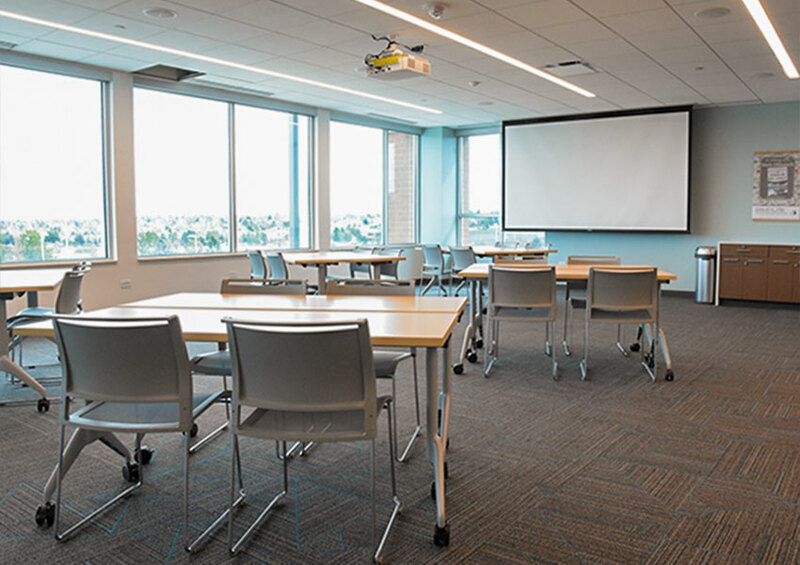 This private room on the second floor features Wi-Fi internet access, a 65-inch wall-mounted LED television, Blu-ray player, and HDMI connectivity for presentations and conferencing. 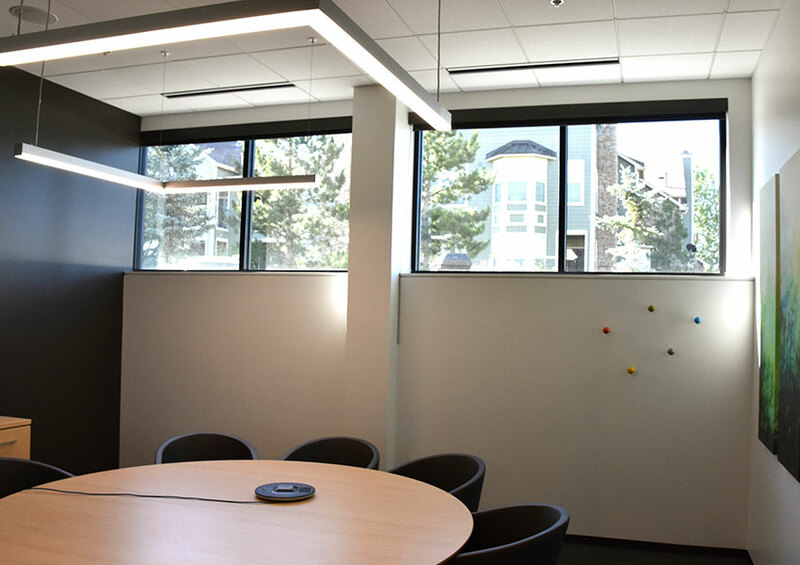 This classic meeting space features a ceiling-mounted projector, projection screen, and Wi-Fi internet access.